Sony isn’t exactly the coolest name in technology, which is why we were surprised to see the company set up shop directly across the street from the Austin Convention Center at South by Southwest. Stepping inside Sony’s makeshift Wow Factory was like seeing into a future where virtual and augmented reality are full-body experiences not necessarily tied to a clunky headset or a phone. And while none of these technologies are ready to buy, Sony’s ambitious set-up was seriously impressive. We’re not sure there’s a big market for the Synesthesia Suit, but this virtual reality experience is a trip. 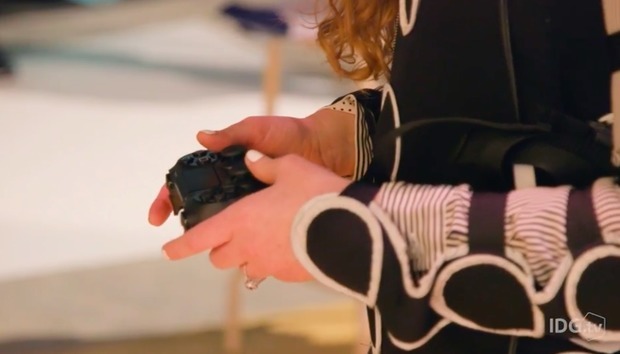 The suit has 26 actuators that vibrate all over your body once you’re buckled in—which takes some time—and slip on a PlayStation VR headset. The Rez Infinite demo we tried was wild, to say the least. Instead of simply hearing the music’s bass through the TV or a pair of headphones, the suit radiates sensation throughout your body, from your arms to your ankles and down your torso. It brought the game to life in a totally unique way. Then we went for a bike ride in Sony’s Cyber Gym and Music Visualizer, which was like a SoulCycle class in space. A solar system was projected on dome-shaped theater, and the display responded to our movements on the stationary bike. It was a little disorienting, to be honest, but cycling through space was a one-of-a-kind experience you’ll only get at SXSW. Sony used its relationship with Marvel Studios to create a “Spiderman: Homecoming” experience to show off its new projection mapping technology. The climbing challenge used a moving projector that responded to the climber’s movements without the climber distorting the projected image. We left that demo to the pros, because one of us would’ve likely injured ourselves attempting to climb this wall, but it was a showstopping way to showcase what some might consider a boring piece of technology. We tried on a wearable prototype that uses microphones to capture the sound of your movements as part of Sony’s Motion Sonic Project. The cuff also has built-in motion sensors so you make music and control beats just by moving your body. A professional dancer’s demo was a little more awe-inspiring than our own “dance” moves, but we could envision this being a cool wearable for kids and creatives if it ever makes it to market. Our last stop was the Mixed Reality Cave, where Sony used a short-throw 4K projector called the Warp Square to create a virtual experience without a headset. The cave itself was a small room that projected imagery on four high-contrast screens on the walls with sensors to interact with the installation. We traveled to Machu Picchu, created music by tapping the walls, and immersed ourselves in bizarre art, all without leaving the room. Sony’s Wow Factory was a perfect example of why people still go to South by Southwest: to see technologies that could change our lives, not just ones that make great holiday gifts.